Read our helpful guide to second hand Alfa Romeo 156. AA Cars works closely with thousands of UK used car dealers to bring you one of the largest selections of Alfa Romeo 156 cars on the market. You can also browse Alfa Romeo dealers to find a second hand car close to you today. 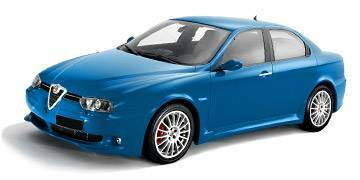 All used Alfa Romeo 156 on the AA Cars website come with free 12 months breakdown cover. The Alfa Romeo 156 is a compact executive car first launched by the Italian manufacturer in 1997, and discontinued in 2007. As the replacement for the 155, the 156 is handsome and refined (as almost all Alfas are), while a 2.4 litre JTD diesel - one of the first diesels in the Alfa range - delivers impressive performance and power. There's not a great deal of space on offer, which does pit the 156 behind some of its rivals, but a fun drive, competent handling and genuine desirability makes it a car which - although it has now aged somewhat - is a rare and exciting alternative. It might not quite be a match for the 3 Series, but it is certainly more of a stand-out choice.